Atlanta, Georgia’s caustically enhanced emitters of blackened savagery, WITHERED, unleashed a brand new track of tumultuous contents. On the heels of wrapping up a U.S. tour with Fister, Oryx, and Un this past week, WITHERED issue a blistering new single offering, “Somnium Decay“. The track is available now exclusively through Decibel Magazine‘s ongoing Flexi-Disc series, and streaming below. 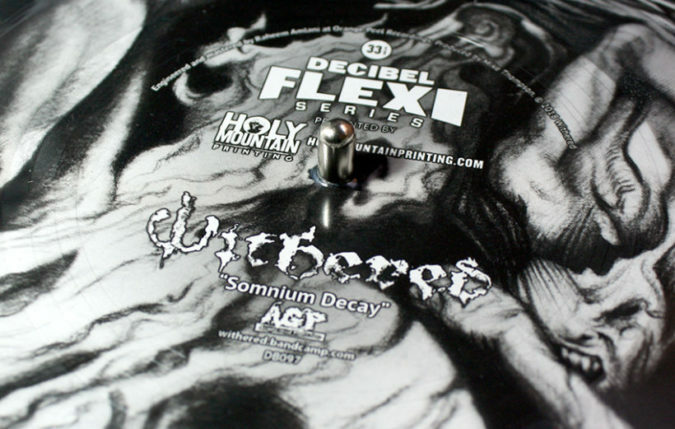 It is included on a 7″ picture flexi single within the latest issue of Decibel Magazine (#171). You can find subscription information HERE.